When spring arrives, our household gets a little hectic. Between the yard work, end of school activities and summer activities kicking in, our treasured dinner-time almost becomes an afterthought! Initially, I experimented with a few different recipes using soup mixes, but I finally decided to omit the soup mix and use ingredients I often have on hand. In this recipe, the mixture of chicken broth and sour cream take the place of soup mix that is called for in more traditional casserole recipes. The result is a delicious dish that uses fewer processed ingredients! However, the real judge of success was my daughter. After her first bite, she concluded, “It tastes a little different than the recipe from daycare—but it’s better!” Ahhh, so good to hear! Preheat oven to 425 degrees F. Melt the butter in a large ovenproof skillet over medium heat. Add the garlic and cook, stirring occasionally, until soft, about 2 minutes. 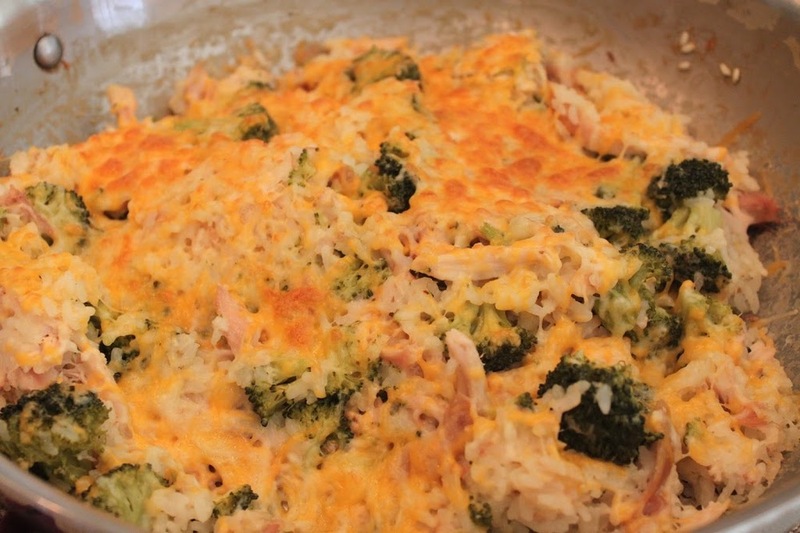 Add the broccoli, chicken, rice, and salt and pepper to taste. Whisk the chicken broth and sour cream in a bowl, pour into the skillet and bring to a simmer. Stir in half of each the cheddar and parmesan. Cover tightly with a lid or foil, transfer to the oven and bake until the rice is tender and most of the liquid is absorbed, about 20 minutes. Turn the broiler on high. Uncover the skillet and sprinkle the remaining cheeses on top. Broil until golden brown, about 2 minutes. Serves 4-6.